One of Tuscany’s most traditional dishes is the Ribollita soup. This soup is very popular after the wine harvest is done and autumn is in full swing. Ribollita is made of bread, beans, and vegetables of course. Due to the fact that Tuscans do not have a rich culinary history in their pasta dishes, but they are known as “mangiafagioli” all over Italy. Mangiafagioli means “bean-eaters.” It is certain that Tuscans eat an abundance of beans and legumes of all kinds. The meaning of the word Ribollita, is simply “reboiled,” which dates bake to the middle ages in the Tuscan countryside. Pellegrino Artusi, who was considered the godfather of Italian cooking, called Ribollita “Zuppa Toscana di Magro alla Contadina,” a “lean peasant’s soup from Tuscany.” Artusi was the author of La Scienza in Cucina a L’arte di Mangiare Bene, the Italian cuisine bible written in 1891, the first book to include a collection of dishes from regions all over Italy. 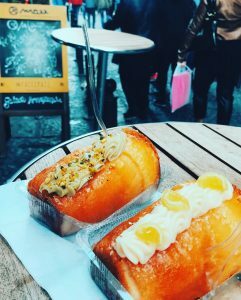 Baba from Napoli! A rum-soaked cake. The peasants who served the lords and ladies would take the leftover bread crusts and scrape the used plates clean of their flavorful juices after a meal. It was made with the reheated leftover minestrone or vegetable soup. The peasants would soak cannellini beans in water and let them sit by the fire with water, rosemary, garlic and olive oil, cooking very slowly overnight. The peasants would take the vegetables growing in their small patches the next day, chopping them into chunks and added to the pot. They would use carrots, onions, kale, potatoes and anything else growing in the garden that could be eaten. Lastly, they would drizzle extra-virgin olive oil onto every portion prior to serving the dish. 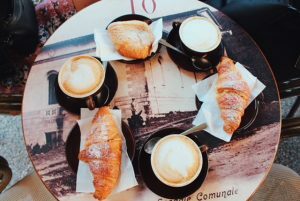 A traditional Italian breakfast, cappuccino and croissants! One of the best parts about the Ribollita soup is that it is routed in the Tuscan traditions of “non buttar via niente” which means “don’t throw away anything!” This gives new life to leftovers and provides a sustainable outlook on food! Due to the fact that the quantities were so large, the soup could be reheated over and over and thus would result in a tastier dish each and every time. The interesting thing about Ribollita though, is that the ingredients are meant to be whatever you have on hand. The three main ingredients that must remain constant in this recipe are Tuscan bread, cannellini beans, and Tuscan kale. This dish is so comforting and delicious in the autumn and winter months and below is how to make this simple Tuscan dish. First, you want to start with a basic minestrone soup by dicing up a variety of vegetables and cooking them in olive oil until they’re soft and not browned. This recipe calls for “certain” vegetables, but ultimately, Ribollita was born based on variation and should be altered from what is in season or what you already have at your disposal. Gather some onions, garlic, carrots, and celery. Kale, as stated before, is very important in this recipe. Add a liquid such as water or veggie stock and a bundle of herbs. After the vegetables have simmered until they’re soft and tender, we want to add the cooked beans and bread. It is okay to use canned beans, but just know that the traditional Tuscan way is homemade, soaked in water and cooked. Again, it was traditional to use stale bread in this recipe as a way to use bread that could not be used much for anything else, but it is okay to use fresh bread if that is what you have. It will taste just as good and melt more quickly into the soup. At this point in cooking the Ribollita, it should be about ready to be served. You are able to serve it as a chunky soup with olive oil, black pepper and maybe a little salt, or if you like it thicker, you can continue to let it simmer in the pot for awhile longer. It is important not to forget the drizzle of extra-virgin olive oil before serving and a sprinkle of parmesan cheese if you like! Ultimately, Ribollita is the perfect dish for everyone because it is gluten free, dairy-free (without the parmesan of course), and most traditionally without any meat. There will be no complaints at the dinner table if this is what is served. 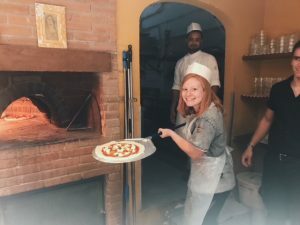 Making a pizza in a 500 year old brick pizza oven! Unreal. In conclusion, the traditional Tuscan roots of Ribollita soup carry more weight than simply delicious flavor. 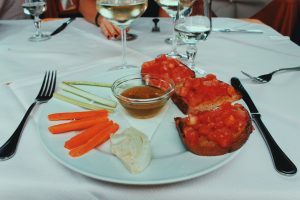 It carries the history of Tuscany and its tradition of limiting food waste, appreciating the food that you are eating, and also creating inexpensive and flavorsome dishes that can feed a lot of people or provide many meals. This concept is extremely important today, as globally, we have become a society that cares very little about the amount that we are consuming and ultimately, wasting. Learning to use everything to make something delicious, making something out of nothing, is very much so the Tuscan attitude. This Tuscan attitude should be more widely spread as we explore sustainability more and more, as we need it more and more every single year. The traditional Tuscan Ribollita is a dish that I will take home with me, share with my parents and siblings, and one day, a family of my own. This dish has been a favorite of mine throughout my stay in Florence and I know it will be a dish that I continue to prepare for the rest of my life. Sarah was a Fall 2017 SAI Florence student from the University of Kentucky.